When Indiana Jones lost the Cross of Coronado in the third movie, the guy who took it from him said “You lost today kid — but you don’t have to like it” — then handed him a hat. If the young Jones was working on a stubborn bolt stuck at a funny angle, the guy would have handled him a universal impact joint. Seriously. Ok so a universal joint is never gonna be the stand out prop star of a movie. But what it can do is remove the obstacles between you and the completion of a hard day’s work. 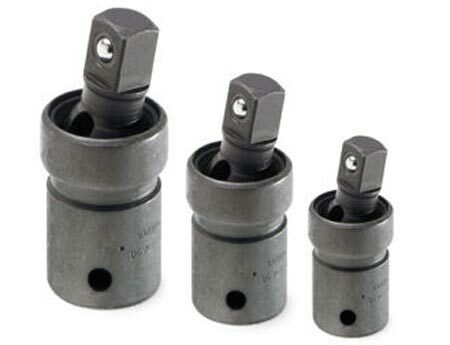 Impact adapters are made from hardened steel designed to take the massive force that an impact wrench or driver can dish out. Throw in some swivel action from the ball joint, and you have the easy answer to a hard-to-reach rusted bolt, like, say, an exhaust header bolt that’s seen more than its share of under-car action. Trust us: Get one and throw it in the drawer. It’ll do a lot more for you than some cool-looking hat a movie star would wear. Street pricing starts at $10. Update: Wait, scratch that. I’d rather have Indiana Jones’ hat. But the universal impact joint’s still pretty useful.